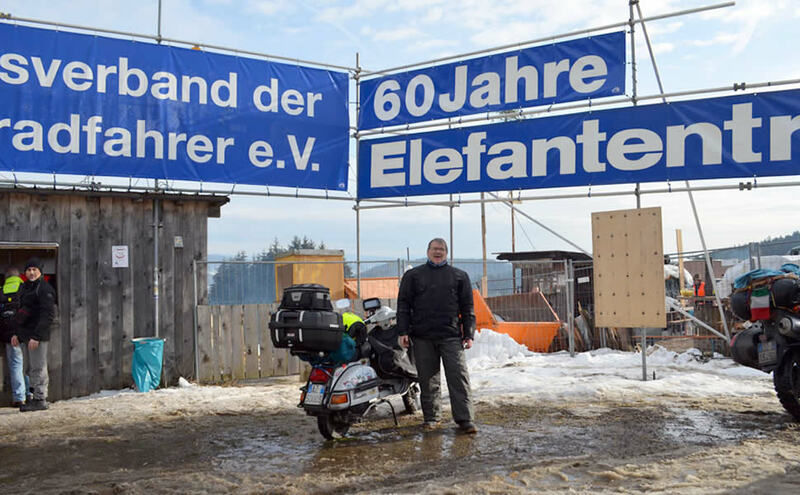 Characteristics of this 60th Elefantentreffen are the high temperature, little snow and a lot of mud. 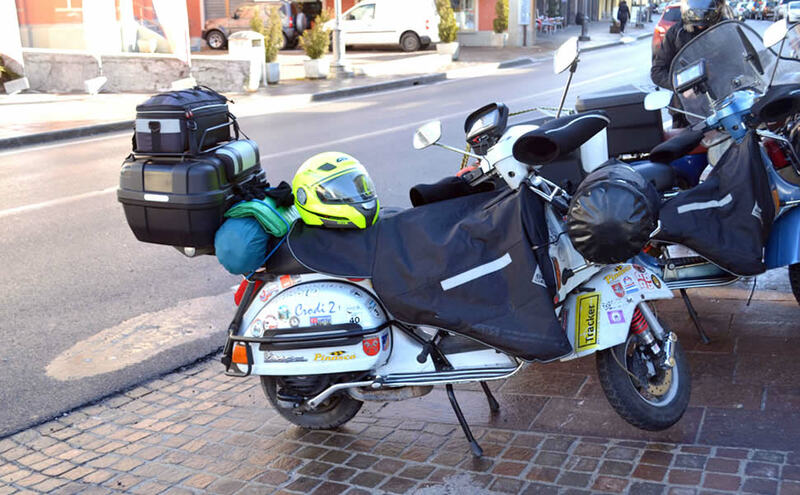 I leave Wednesday 27th January along with two other Vespa enthusiasts, Rudi and Luigi, at 6am to take full advantage of the hours of light, as at night the roads can ice over and riding in the dark can become dangerous. At 8am on Thursday we leave Passau and we get to the entrance of the rally meeting, about 40kms away, at 10. 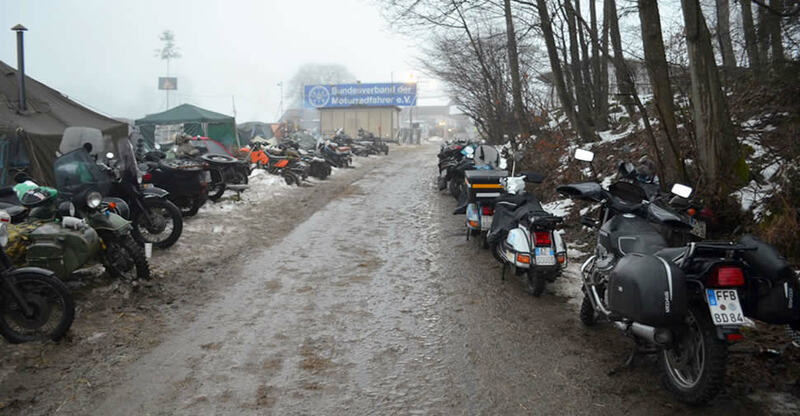 There’s mud everywhere, both due to the melting snow and the continuous passage of motorbikes. Using the ‘old’ snow to fix the holes in the ground, we manage to create some clearings for our tents, after having created a layer with straw, only real insulating material. After setting up the tend I unload my luggage from the Vespa, we light a fire and prepare coffee. 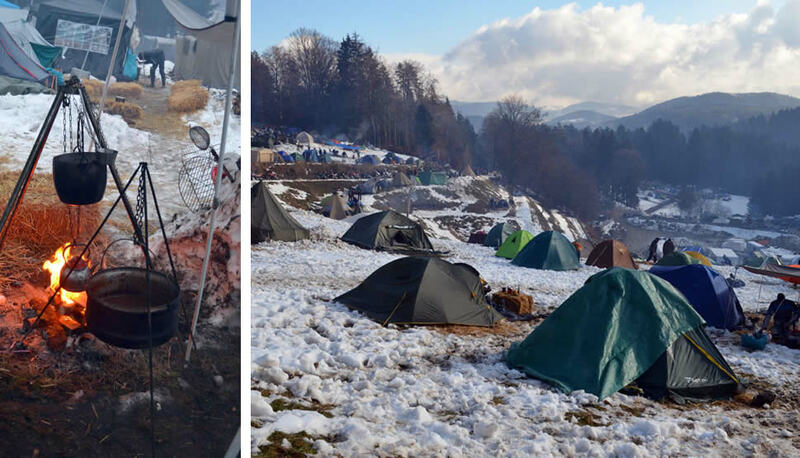 We work on preparing the camp for a few hours: positioning bales of straw next to the fire to use as chairs, creating an area for our provisions, pans and grills. Meanwhile the pilgrimage of people welcoming us begins, but, once we’ve finished arranging everything, it’s our turn to roam the valley looking for our friends. The starting point of our wandering is the low part of the valley, “the ditch” called by the locals Hexenkessel or “Witch’s cauldron” where there are some market stalls and a truck equipped as a diner. Here they sell gadgets and souvenirs of the rally. It’s difficult not to buy something, even if the prices are outrageous. The life at the gathering is made up of casual meetings, making new friends, curiosities and tastings, seen that the pan that everybody carries is filled with beer, soup, or whatever your friend’s cooking. We pass the time admiring the parked motorbikes which often present aesthetic and mechanical customizations, sometimes absurd, others brilliant, becoming immediately the topic of endless discussions round the fire. Friday the group is complete: we are a total of 4 Italians, 4 Croatians, and 2 Slovenes with 4 guys from Palermo who joined up with them. 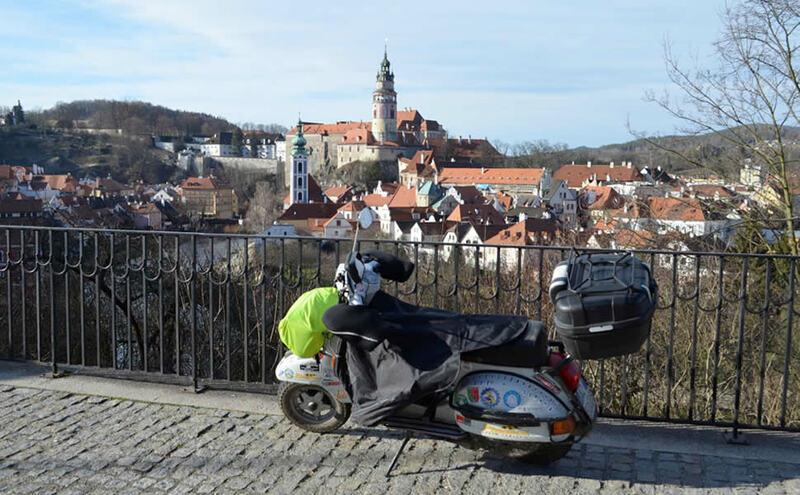 After having broken camp Saturday morning, the group heads back to Italy, while I take the long way back on a solitary journey through the Czech Republic, Bohemia and Austria. On February 1st at 7pm I park my Vespa in the garage. It took me almost 12 hours to do a little more than 500kms, it’s certainly not a record, but I can’t complain. In the end I think it has been a good Elefantentreffen, it’s true I missed the ice, the hands towards the fire to try and find some warmth and the pleasant sensation of drinking some mulled wine in the snow… But you can’t have everything, sometimes you need to be happy with what you have!